At power up, the ICM 450 evaluates the incoming power for proper phase, amplitude and symmetry (voltage imbalance). If the phase input at the line side connections is within user-set parameters, the load energize LED is turned on and the internal relay is energized. If a critical fault condition exists (phase loss or phase reversal) the ICM 450 will immediately de-energize. If a non critical fault exists (imbalanced, high or low voltage) the ICM 450 ignores the issue and writes a note to memory. Programmable 3 phase line voltage monitor with 25 fault memory, high temperature LCD display, easy setup & clear, diagnostic readout of system faults. The ICM 450 (a UL listed component) is designed to protect motors and other 3 phase equipment from premature failure and damage from imbalanced, over/under voltage, phase lose, reversal, incorrect sequencing and rapid short cycling. The ICM 450 phase monitoring can be installed in most Advantage equipment using three phase power, including central cooling and some portable equipment where panel space is available. 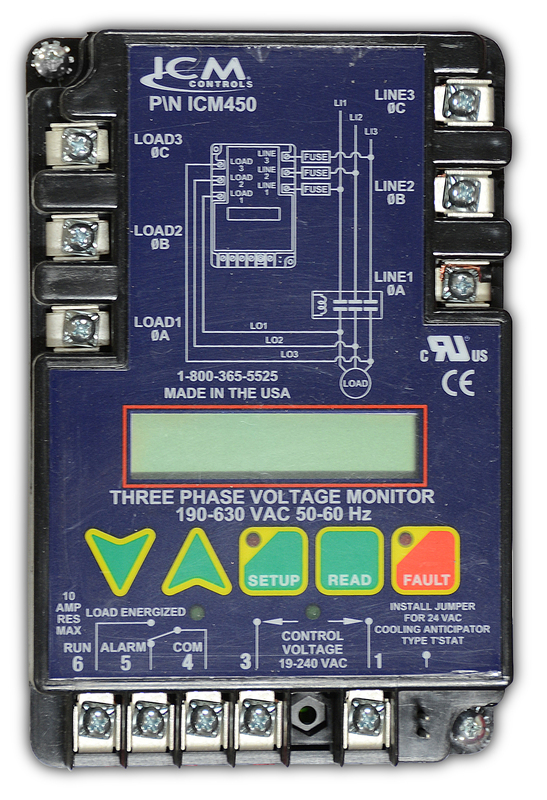 Advantage installs the ICM monitor on the incoming power supply protecting all system motors. For example, a 3-circuit Titan central chiller with three compressors, process, evaporator and standby pumps needs only one ICM 450 monitor to protect all 6 motors. Load side monitoring can be done as well but requires an ICM 450 three phase monitor for each motor. Would you like to Download FYI #314 to your browser?